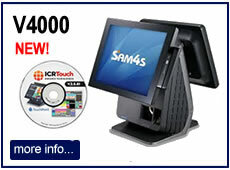 We supply Point of Sale (POS) systems that are ideal for all types of bars and clubs. Whether you run a small members club, a local music venue, theatre, hotel or a bar with restaurant, we have a number of different systems to suit various bar epos system requirements and budgets. Prices start from just £695 for a complete system, and we offer a Service Pack for initial menu setup and operator training. Our best EPoS solutions for pubs include all the components you require to setup and operate your business including receipt printer, cash drawer, cables and EPoS application software are all included. Optionally add kitchen printer, kitchen monitor system, dallas keys or fingerprint reader for staff login. We can setup your food and drinks menu and provide on-site installation / training as part of our service package. We have specialist solutions for small and large pubs and bars. These pos solutions cater for all types of alcoholic and soft drinks, hot drinks, snacks and restaurant food. You can use the till system for ready-made packed food or cooked to order food. The system will cater for all sizes of drinks and price variations: pints, half-pints, 125ml / 175ml / 250ml wine glasses, bottles, 25ml single shots, 50ml double shots, splash / dash and other user-defined sizes. These can link proportionately to your purchased stock of barrels, cases and full bottles to give you accurate stock control reports. If you operate a members bar or social club, our systems support multiple price levels so you can operate different tiers of pricing for different types of transactions. For example, one price for members, another prices for guests. 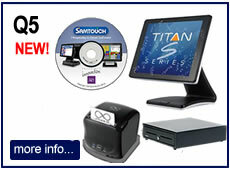 We also have systems that support Magnetic Swipe Cards for membership and we offer a bureau service to design, print and encode membership cards from only £0.40 per card. We have options of 15" touchscreens and lower-cost hybrid systems with a 7" touchscreen and keypad. On our Windows-based solutions, you can choose from our standard grey/black touch screens or choose from our designer range of colour co-ordinated touch screens, with matching printer cover. Our till systems for bars offer a wide range of features suited to the different types of food and drink serving establishments. Please note that not all features are available on all our systems - check the specification of your intended system if you require a particular feature. 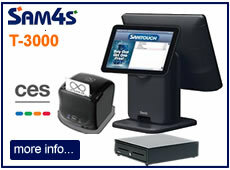 All our till systems can optionally have a kitchen printer attached. With a kitchen printer or bar printer, food and drinks orders can be instantly transmitted to the preparation area from the till point. This saves valuable time as staff are not walking backwards and forwards to deliver order slips, enabling them to attend to other customers and provide a faster more efficient service. It also results in less mistakes with customers orders which can occur when handwritten instructions cannot be properly read or if kitchen staff cannot hear orders which are shouted across. You can choose from a kitchen printer with a tear bar (for manual tear-off) or an auto-cutter. Some kitchen printers are equipped with a buzzer or bell to alert kitchen staff to new orders.For bars we normally recommend impact dot-matrix mini printers for kitchen use which print on plain paper (either 1-ply or multi-ply), as the print on thermal paper can be damaged if exposed to heat or moisture. The kitchen printer can be connected with an RS232 Serial Cable - we recommend no more than 25m length for reliable operation. Alternatively a printer with Wireless Ethernet interface can be used. With the kitchen monitor system orders are instantly displayed on large screen in the kitchen. A waterproof 'bump bar' attached to the system allows kitchen staff to remove completed orders from the screen once they are prepared. You may also set a time limit so orders will start flashing in red if the time limit has been exceeded. With the 'clerk interrupt' feature, multiple staff members can use the same till to process multiple orders. One staff member at a time can be physically using the till, adding to or amending a customer order, while orders being processed by other staff are temporarily parked. Staff can switch to their orders by logging in with their dallas key, fingerprint reader or with their username. Orders may also be retrieved by table number or from a list. Table Management allows you to keep track of post-pay customer bills, either for tables, tabs or function rooms. You define the zones within your bar, for example, ground floor, terrace, balcony and so on and specify the number, size and shape of each table. The epos system allows you to allocate menu items to a table, print interim bills and final bills. More sophisticated features including splitting bills between several people on a table, transferring bills or certain bill items from one table to another table and monitoring the stage for each table in the cafe (eg. menu, starters, main course, desserts, final bill, payment). The layout of your menu on the system is very important as it determines how quickly and accurately your staff can operate. Our bar epos systems allow you to have hot-keys on the front screen for your most popular food and drink items, you can colour co-ordinate menu buttons (eg. cold drinks in blue, hot drinks in red etc) and you may also incorporate text, pictures or graphics on menu buttons to further speed up identification for staff. You can define a series of hierarchical screens and pop-up windows for the different sections of your menu. For example, in a bar you may have your menu split into Beers, Spirits, Wines, Soft Drinks and so on or you may have a more detailed structure such as Whiskies, Vodkas and so on. Our bar epos systems will allow you to structure the on-screen menus to suit your particular requirements and you can add/change items whenever required. In addition, you may also have pop-up menus for condiments and cooking instructions. Where you require customisation, for example, for pizza toppings or sandwiches, it is possible to build a screen layout to facilitate all the options. For example, white bread or brown bread, extra tomatoes, no onions, ketchup, mayonnaise, chilli sauce and so on. Cooking options such as mild, medium or hot spicy can also be programmed. Size options such as bottle, glass, pint, half-pint, single or double shot may also be set up. The 'floating clerk' feature is very useful in a bar with multiple terminals. It allows staff to retrieve a customers bill from any till on the network, add items to the bill and to finalise the customer bill. Table Reservations is available on our advanced epos system to book tables, function rooms and other facilities. With stock control, you can keep track of all the food and drink items at your bar. You can specify minimum stock levels to prompt re-ordering. With Recipe / Ingredients Management, you can specify the portions that make up each menu item - for example, a slice of chocolate cake may be made up of 50g of flour, 30g of sugar etc. The system will deduct the items from stock, either as whole items or proportionately, as they are sold. With stock control, you can sell items by the whole (eg. bottle, can) or you can serve measures such as pint, half-pint, single shot, double shot, glass etc and the bar epos system will adjust the stock levels accordingly using fractional values which have been pre-defined. With the staff timekeeping module, bar staff are required to login and logout at the start and end of each shift and to record any breaks. This allows you to generate summary reports showing the hours worked for each person to assist in wages calculations. With our advanced bar epos systems, it is possible to program in meal deals, promotions and other discounts for automated price calculation. It also allows for 'happy hour' and 'early bird' types of pricing that is linked to particular time periods. UK Mainland delivery charge is £12 per order. For international orders, Scottish Highlands & Islands please contact us for a quote. Remote set up and remote training is included in the Service Pack. On-site installation and staff training at your premises is optionally available. Please contact us with your postcode for a quote. All our epos software is on a permanent licence so there are no ongoing monthly or annual software licence fees to ever pay. Pay once, and that's it! 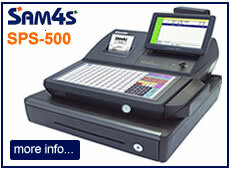 Sam4s equipment is covered by a 3 year warranty. Software support is included in the 1st year. Support is optional thereafter and costs just £25 per month if required (paid annually) or can be purchased on an ad-hoc basis without any subscription. The POS software license is effective permanently regardless. Friday 19-April-2019 23:33 Our office is currently closed. We will be open again from 10am tomorrow.